Khalen Saunders of Western Illinois is a big time prospect whose athletic ability helped his draft stock. Scouts were blown away by his back-flips for his size. WR – Andy Isabella, UMass, 5’ 9 186 lbs: Have a full report you can read on Andy that I did back in the Late Summer. Isabella is now getting some love after a nice week in mobile of practicing a couple big catches including a beautiful 19 yd TD. On the TD he showed his sheer speed & elusiveness. With his an impressive catch change of direction breaking a tackle. He proves to be top wide out of the class despite being a smaller pass catcher. Truly will be a special player in the slot & in the return game. His draft stock went up as many of these smaller school guys did as well. On the year Isabella has 102 catch 1,698 yds & 13 TDs. 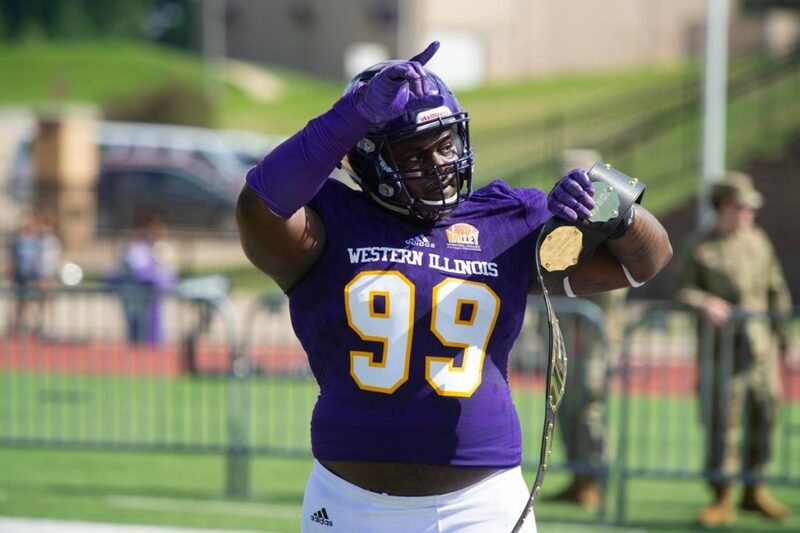 DL – Khalen Saunders, Western Illinois, 6’2 310 lbs: Now everyone is on the Saunders bandwagon and that’s fine with me. Stout strong always keeps a good pad level. Very hard to contain with a strong punch or the quickness to shed blocks. Drum roll feet that are always moving high motor super athletic interior D lineman that would have no problem moving outside in a 3-4. Had a great week of practice followed by an impressive game that included a sack followed by a QB pressure. Seemed to play even more inspired with the birth of his daughter happening while he was in Mobile. Featured him back in Aug & although I don’t know him personally I remember him thanking me at the time. On the year he had 72 tackles, 13 TFL & 6.5 sacks. First Team All American selection for the yr. Seemed very coachable in practice from the little I gathered he showed improvement got high praise from the coaching staff. OT/OL – Max Scharping, Northern Illinois, 6’6 311 lbs: Another prospect you can find my report from Draft Diamonds by googling it but he is worth a revisit. As he plays both RT & LT showed he could hold his own all Senior Bowl week. Wide base good bend covers a lot of ground. Quick kick foot with strong plant step fluid hips. Can hold his own in a run & pass protection. Think Pass protection might be his strong point which is hard to come by. 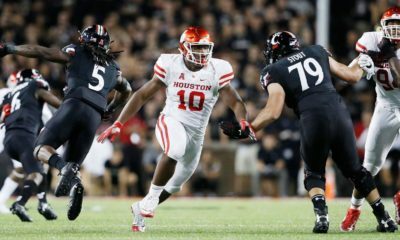 Viable OT prospect with the proper size for the position. His value rose quite a bit SR Bowl week. Glad to double down on such a talented tackle like Scharping. WR – Keelan Doss, U.C. Davis, 6’3 206 lbs: FCS Performer of Year Award. Can google my report on Davis from before the season. Some compare him to Kealan Allen of the Chargers. Think he is a little more durable but I do see the homerun potential much like Allen. Along with that elite lightning speed that comes with an early round wideout. Doss is a precision route runner with legit extension winning battles with both his legs & hands he is 6’3 but id swear he was 6’5 with his radius athleticism and flexibility. Also shown to be a good blocker which will come in handy in a zone blocking or RPO style team. Doss has some silly career numbers with 321 catches, 4,069 yds & 28 TDs. OL/OG – Nate Davis Charlotte, 6’3 311 lbs & OC- Garrett Bradberry, Washington State, 6’ 3 300lbs: The OL prospect from Wash State might be the most plug & play ready O line guys in Mobile last week. Great technique quick feet lucid hip perfect bend.Bradberry a 1st Team All-Conference. Can drive through guys on run blocks but also known for his pass protection skillset. Davis is a little rawer but still looked good, not quite as technically sound but showed his power limited his mistakes. He has all the tools needed the power ability to protect his QB & help create lanes in the run game. The right coach could help Nate Davis become a prospect to watch. Davis a 2nd Team All-Conference in 2018. TE – Tommy Sweeney, Boston College, 6 ‘5 260 lbs: Good week showed he is more than an inline blocking TE can catch & move quite well for a 260-pound mountain of a man. Had some nice blocks & an acrobatic grab in the game. Was impressive all week in practice which manifested into a strong overall week. Safety – Darnell Savage, Maryland, 5’11 200 lbs: Liked the Maryland prospects the last couple years. Aggressive. Played some tight coverage on quick wideouts. Can shadow WR’s on routes well. Savage is just that when it comes to coverage or tackling. DE – John Cominsky, Charleston 6-5 275: I watched him getting coached up well on the sidelines & the coaches praising him on his improving techniques throughout the week. Seem to have to everything need to be a true 43 Defensive end or edge rusher. Got in the QB’s face had a nice PBU to cause a punt in the 4th. On the year 55 tackles 2.5 sacks & 3 ints per HERO Sports.com. QB – Ryan Finley, N. C. State: 6’4 208 lbs: Got the North going in the 2nd half driving his team down for their first TD to start the 3rd qt. Started the week a little rough throwing 2 INT’s day 1 but improved every day afterward. Coach Gruden spoke highly of Finnley after showing such resolve then having a good day to boot. Was the QB that threw the TD pass to Isabella on a 4th & 2. Finley is a 1st Team All ACC for 2018 season. That type of fortitude coachability & a nice week has moved his name up many a draft board. Currently has a 5th rd grade per draftscout.com. Have a feeling he is moving up to about the 3rd rd easily after this week. Possibly even higher with a good combine or pro day. QB Tyree Jackson – Buffalo 6’ 7, 245 lbs: Really looked better then I remember him looking. Must be working with some talented trainers cause his release & even mechanics look downright better. In the 4th he had a nice a scamper to set up a score I Could see that on his TD pass where he got the ball out fast, hard & right on the money. We know he has legs he can move around if needed but seems like he can depend on his arm. A good week changed some minds grew his fanbase. Think he could surprise some people how early he could go. Lack of QB’s & a solid combine could see his stock rise in a hurry. WR’s – Gary Jennings 6’2 218 lbs: David Sills 6’4 203 lbs, West Virginia: Both are extremely explosive wideout that can make catches in traffic. Both are ridiculously fast in and out of breaks. Sills looked good all week made some nice plays showed off his speed & agility. Sills had a nice TD late in the 4th. Sills also had 986 yds & 15 TD’s on the yr. Jennings looked good all week had a TD in the game on a beautiful contested catch in the endzone. He also made another long grab on a bomb from. Jackson of Buff early in the 4th. Gary Jennings Senior yr was good as well with 986 yds 13 TDs. DB/ S – Nasir Adderley, Delaware 6’0 200 lbs: Delaware is producing some great D prospects. I featured his teammate from the Dream Bowl also from the secondary. Adderley had a noteworthy week capped with a nice game that included an INT. Scouts are very high on the intense Blue Hen DB. LB – Terrill Hanks, New Mexico State 6’ 2 230 lbs: 111 tackles 7 sacks & 15 TFL on the year he is a versatile run gapping pass rushing & above average covering inside backer that can play outside with no hesitation. Was around the ball all week stands out to me, Heard comparisons too D rookie & small schooler Darius Leonard from last years draft. I see similar fluidity, reach athletic ability. A name to look for day 2 this April top 5 inside LB prospect. RB – Wes Hills, Slippery Rock, 6’2 218 lbs: Had a TD called back but looked pretty quick for a big back a late add from the NFLPA Collegiate Bowl. Scouts like Hills a lot & on a short week he showed me exactly why he is a scout fav. DB – Roc Ya Sin, Temple, 6’ 2 190 lbs: Has a nasty streak can cover has great size physical can run with the best. Got beat but came right back locking down his side. Single digit Temple player means he is one of the toughest players on the team. DB Lonnie Johnson, Kentucky the 6’3 safety deserves a shout out too. OL – Tytus Howard, Alabama State, 6’6 311 lbs: Needs to get wider & more square but overall held his ground this week. Everything you need to physically as an OT Howard has. He had a 90 plus grade on the year only allowed 1 sack.